The people living along the coast side of the Ayyubid Sultanate are accustomed to seafaring. The hardy sailors have experienced the advantages of the crossbow, its wide shooting range and its even greater penetration. Clad in light armour these men are a wrath to foreign sailors and yet not less deadly when fighting on land. 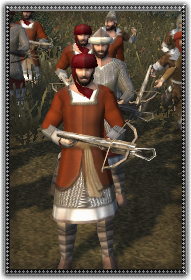 Infidel warriors can not rely on their armour to protect them from missiles, if they have to deal with Maghrebi marines.